Major insurance companies recognize all members of the NBMA as health care providers. 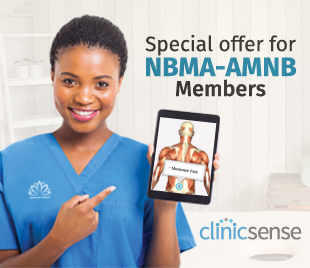 The members of the NBMA-AMNB have a longstanding reputation of providing quality care in a professional manner. The New Brunswick Massotherapy Association has been representing massage therapists in the province of New Brunswick for 30 years. It is the first fully bilingual association of massage therapists in the province, and as such represents registered massage therapists in all regions of New Brunswick. Its members are also part of the Canadian Massage Therapy Alliance, the only national body that focuses on representing professional massage therapists in Canada. Membership in the association is currently limited to those massage therapists who are registered with the regulatory College of Massage Therapy of New Brunswick.